Colonel (Ret.) Paul. F. Pasquina, MD, is Professor and Chair of the Department of Physical Medicine and Rehabilitation (PM&R) at the Uniformed Services University of the Health Sciences (USUHS). He also serves as the Chief of the Department of Rehabilitation at Walter Reed National Military Medical Center (WRNMMC). 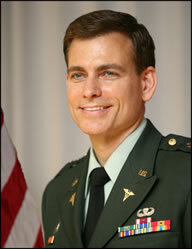 He graduated from the United States Military Academy at West Point and USUHS. He completed his residency in PM&R and fellowship in primary care sports medicine. His board certifications include PM&R, Electrodiagnostic Medicine, and Pain Medicine. His current research efforts are focused on exploring new technologies to enhance the recovery, rehabilitation and reintegration of combat casualties through his work as the Director of the Center for Rehabilitation Sciences Research (www.CRSR.org). Prior to his military retirement, he served in various leadership roles, including the Chief of Orthopedics and Rehabilitation; Consultant to the Army Surgeon General; and Senior Officer in Charge of the Ortiz Medical Clinic, International Zone, Iraq.